Here you can find all info about Black Jack from Sweet Seeds. If you are searching for information about Black Jack from Sweet Seeds, check out our Basic Infos, Gallery, Degustation, Strain Reviews, Medicinal Properties, Shop-Finder and Price Comparison, Lineage / Genealogy, Hybrids / Crossbreeds, User Comments or Threads for this cannabis variety here at this page and follow the links to get even more information - or list all Black Jack Strains (±5) to find a different version. If you have any personal experiences with growing or consuming this cannabis variety, please use the upload links to add them to the database! Black Jack is an indica/sativa variety from Sweet Seeds and can be cultivated indoors (where the plants will need a flowering time of ±63 days) and outdoors. Sweet Seeds' Black Jack is/was only available as feminized seeds. This classic strain features great hybrid vigor and it is totally adapted to indoor grows. When planted outdoors, directly in the ground and with enough sunlight, it becomes a resinous hairy monster of about three meters of height. 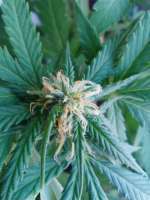 Where to buy Black Jack cannabis seeds? Black Jack from Sweet Seeds is available only as feminized seeds. Regular seeds are not available at the moment. In 20 seedbanks, we found 57 offers between USD 7.36 for 1 feminized seed and USD 1266.81 for 150 feminized seeds. If you are looking to buy Black Jack Cannabis Seeds from Sweet Seeds somewhere - have a look to our Black Jack Price Comparison page with all current offers from all the connected seedbanks and shops - or visit one of the following tested, trustworthy and recommended seed-shops directly to check out their current Black Jack offers: Sweet Seeds, Original Seeds Store, Herbies Head Shop, Indras Planet GmbH, Alchimia Grow Shop, Amsterdam Seed Center, Discreet Seeds, Cannapot Hanfshop, Herbalist, Seeds24.at, Oaseeds, canna-seed.com, Chu Majek, PEV Seeds Bank, Canna-Seed Seed Shop, Cheeba Beans, Green Parrot Seed Store, Samenwahl.com, Linda Seeds | Linda Semilla and Zamnesia. We've collected strain info from 8 growers for Black Jack, check out the reviews about the indoor and outdoor grow here. Black Jack gets 7.23 of 10 possible Points in the average! How is Black Jack growing outdoors? How is Black Jack growing indoors? The seedfinder users tested Black Jack and uploaded information about the aroma, taste and effects of Sweet Seeds' Black Jack. Here a short overview, click to the charts or links to get an exact description and find similar cannabis varieties! Here you see the latest Black Jack photos, uploaded from our users! Altogether we've collected 25 pictures from Sweet Seeds' Black Jack, check out our Black Jack gallery to view them all. One medical user provided personal experiences about the medicinal values of Black Jack from Sweet Seeds and specially it seem to help with Psychiatric Symptoms. Please find more information about the medical effects and the dosaging of Sweet Seeds' Black Jack here at our detailed medical info page for this variety. Click to show all parents of Black Jack in our dynamic family tree map. Altogether we've collected 6 user comments about Sweet Seeds' Black Jack. Here you find the 2 english user comments, for the ones in the other langues please click here: spanish (2) or german (2). The pheno I grew was a picture-book representation of the classic Sensi Jack Herer, only shorter and faster. She's slightly finicky and needs lots of magnesium, but other than that she's easy to grow. The buds frost up early and become super dense from week five of flowering. She's a decent yielder, but certainly not a commercial strain. She smells very hazy, i.e. incency, lemony, spicy and peppery, but has also a nice floral / tropical touch to it. The taste is very pronounced: VERY hazy on the inhale, pure spicy pine on the exhale. Super nice! However, the buds need at least a few weeks of curing for the taste to come through! The high is extremely cerebral and energizing, unless you let it take over, then it's very spacy and meditative. Excellent daytime smoke! She has a very druggy kind of high. Strange in a sense. Kinda head-numbing in a way. Mine has only been curing for a few weeks, but at the moment stinks of licorice and spice, with hints of lime zest and pine. The strain changes drastically in smell profile as she dries and cures, reeking heavy of strong lime at the chop, sandalwood while she is growing, and as described as cure begins to set in, and she may develop further yet too as she cures more. The taste itself is more dank and pine with a hint of the lime and pepper. She is a slow grower in veg, needing more time to get big, which she needs to be in order to weigh heavy, as stretch is minimal so a small plant at the flip will limit her genetic production capability, which is not the most fantastic to begin with I wouldn't think. The quality is very good though and really can't be argued with. All this is based on a single pheno though and in less than perfect conditions (overly hot and nutrient deficiencies), grown organically in soil. Do you know something more about Sweet Seeds' Black Jack? Please help to make this database better and upload/connect your information here! Pictures speak louder than words! Upload your "Black Jack" Photos here and help other growers to get a better impression of this variety. You have grown Black Jack together with another variety? Please fill out our Strain VS. Strain direct comparisation form! Our strain reviews are multilingual, searchable and can be very detailed - including data about the grow, aroma, effects and taste! Please upload your Black Jack Review here to help the other seedfinder users! You have experience with the medical qualities of Black Jack? Sharing your information here maybe can help other people! You've stumbled upon a Black Jack related thread into a forum or growers community? Connect it here and enable othe users to find this information fast and easy! You found a related video with additional information or grow-infos about Black Jack on YouTube? Please connect it here to the strain info page!